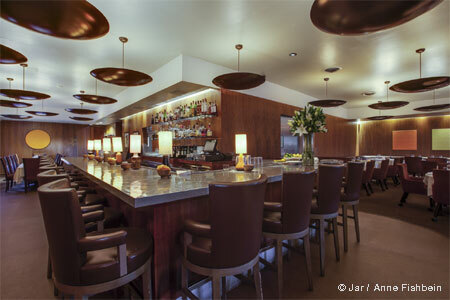 Hip and stylish restaurant in the Cahuenga Corridor with inspired New American cuisine. 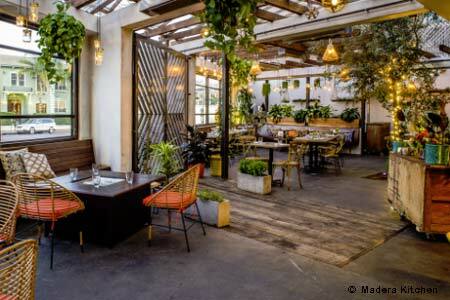 : At the tip of the Cahuenga Corridor, this enticing restaurant has a sprawling patio that sparkles with chandeliers and hanging pendant lamps of Mason jars, cascading succulents dotting walls of reclaimed wood, and a fireplace that brings a romantic warmth to the whole scene. Inside, the hip, modern room is no less inviting, and a long bar is lined with vessels of fresh herbs and produce for the craft cocktails. The New American dishes have offbeat flavor combinations that wake up the palate. Seasonal flatbreads will bring you back for wild mushroom with Humboldt Fog, black kale and thyme. There's plenty to share --- the tender grilled octopus with crispy lemon is especially good. Pastas include goat cheese ravioli while entrées range from roasted half chicken to New York steak. Chocolate flan and bread pudding both make a fine finish. Sundays offer a dynamic brunch menu, one of the neighborhood’s best. There’s also a wine room where guests can enjoy a special tasting menu from chef Vanessa Lauren (Petit Trois, ABC's "The Taste"). The room seats 20 people, and reservations are recommended.